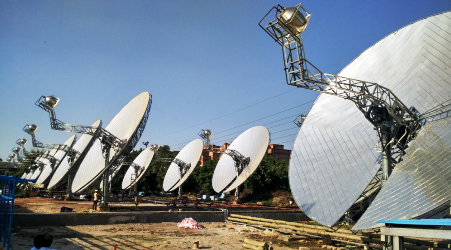 A webinar that took place on 22 May put the spotlight on concentrating dish systems manufactured in India and Pakistan. Titled Concentrating Solar Heat Solutions Available Today for Carbon-Free Industrial Heat and Steam Generation and organised by Spanish-based consultancy ATA Insights, it highlighted the main advantages of these dishes: flexibility and low space requirements. The photo shows a solar process heat installation at a dairy in India. A recording of the entire event and the presentations that were held are available online. Siddharth Malik, Managing Director of Indian-based Megawatt Solutions, presented a wide variety of dish applications ranging from boiler feed water at a temperature of 95 °C to air at 150 °C for drying food or treating sludge. He said his company had also installed systems providing steam at 160 °C to dairies as well as pharmaceutical producers and thermal oil systems running at up to 220 °C for chemical, rubber and plastics manufacturers. Still, he added that industrial suppliers of concentrating solar heat had to deal with a much higher level of complexity than, for instance, EPC contractors operating large photovoltaic systems. Typical Megawatt-brand dishes have an aperture area of 95 m² and a diameter of a bit more than 12 metres. Aperture area is defined as the flat rectangular area specified by the outer perimeter of the mirror field. Thanks to their shape, these dishes require only 1 m² of sealed ground. Another plus is that smaller versions, for example, ones measuring about 20 m², can be used for easy installation on concrete roofs if not enough ground space is available at an industrial site. Zaafir Waheed, Founder and CEO of Pakistani-based Zed Solar, then presented his company’s Solar Invictus 53S. It consists of a dish with 52 m² of aperture area, and a cavity-type receiver, which functions as a Once-Through Steam Generator. A Solar Invictus pilot installation was built at the Mohammed bin Rashid Al Maktoum Solar Park, Dubai, and completed in 2014, according to a paper that Waheed quoted during his presentation. He emphasised that the thermal efficiency of the 2-axis tracked collectors was around 88 %. Concentrating dishes can achieve those values, but the information he provided had been the result of tests conducted in-house. Both manufacturers did not show any third-party assessment of yield or efficiency. The webinar was part of a series of webinars within the MENA CSP KIP programme (The Middle East and North Africa Concentrating Solar Power Knowledge and Innovation Program) supported by the World Bank.